Create multiple markers and display them on Google map with popups and optional attached content. 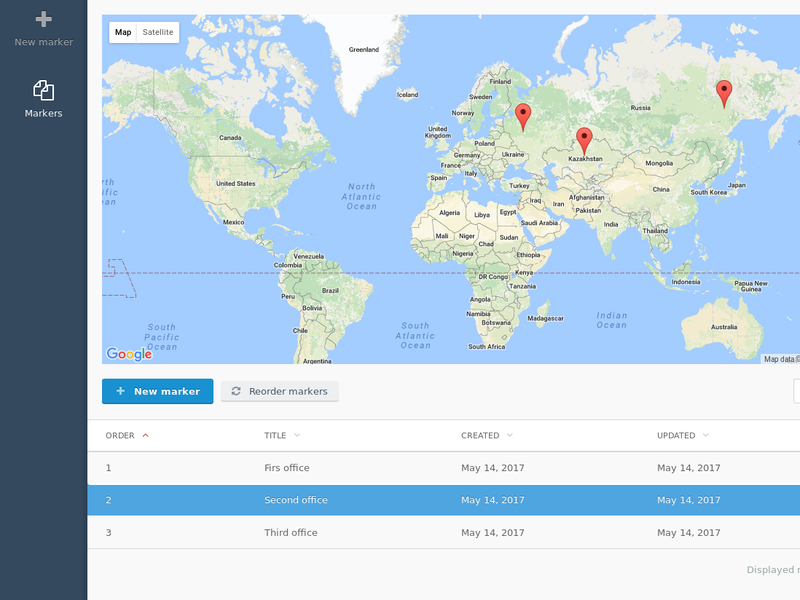 This plugin allows you to create and edit markers to then display them on Google map. Aside coordinates, each marker can have a title, attached image and optional links to other content. At the moment, links to blog posts from RainLab.Blog and albums from Graker.PhotoAlbums are supported. Marker's title, description, image and additional information can be displayed in pop-up window (when clicking on marker on the map) and as a post. Don't forget to set Google API key on the plugin's Settings page. 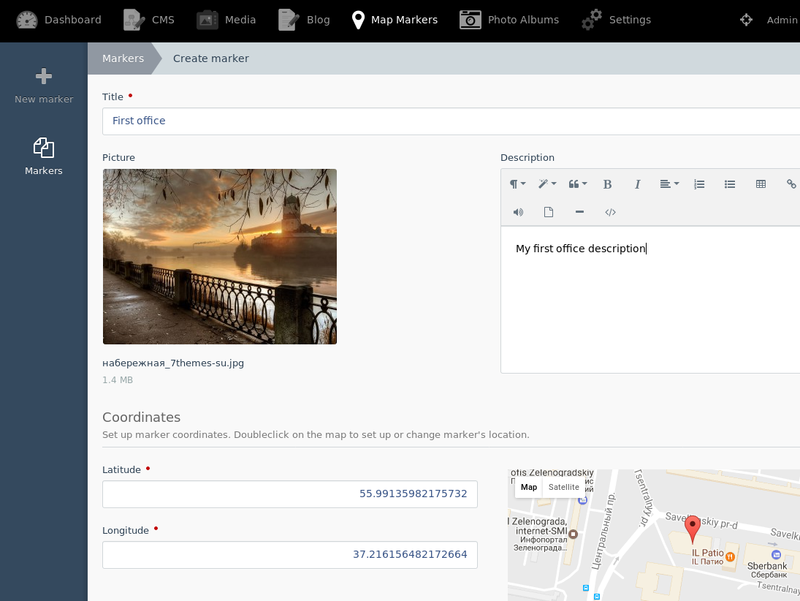 To use the plugin, install it as usual, go to MapMarkers backend menu item, create some markers and optionally link them to blog posts and photo albums. 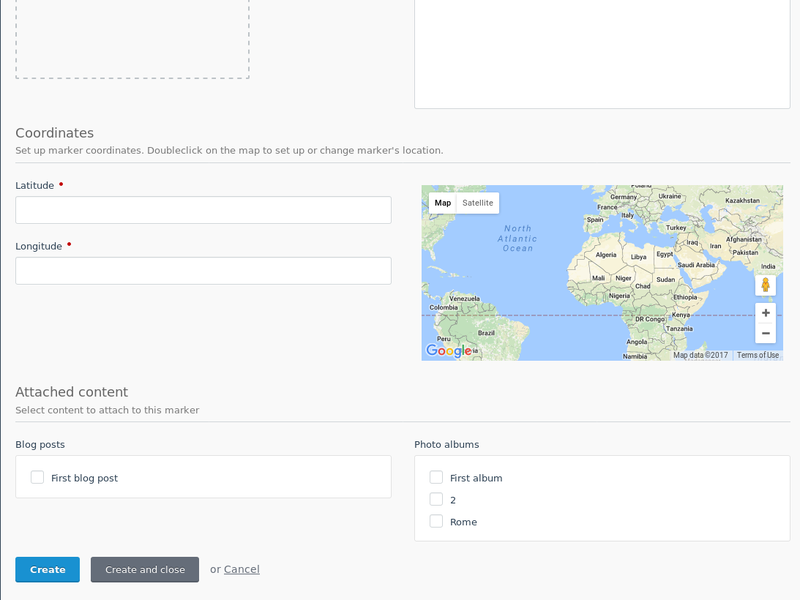 Then add Map component to a page. The map will be displayed with all the markers you created. You can also add Map List component to list markers like posts. See more on component settings in Documentation section. Attaching posts and albums to markers is totally optional. If you have no need for it, you still can create markers with a title, image and description. You can change markers display order by clicking on Reorder markers button on Markers backend page. If a marker has exactly one other model attached (either post or album), marker.singleUrl value will be available both in Map and Markers List component partials. It will contain a string with url to this single attachment. You can use it to link to this attachment from marker's thumbnail and title. An example usage is in component partials. If there are more than one models attached (or none at all), marker.singleUrl value will be an empty string. If there is image directly attached to the marker, it will be used as a thumbnail. If there are posts attached to the marker, the first available featured image from any post will be used as a thumbnail. If there are albums attached, either front or latest photo from the first album will be used. After setting up a component, look at partials at components/map in plugin directory. As you can see, beside default.htm (map container markup), there is popup.htm partial. It is used to render popups when markers on the map are being clicked. Override this partial's markup for your needs. 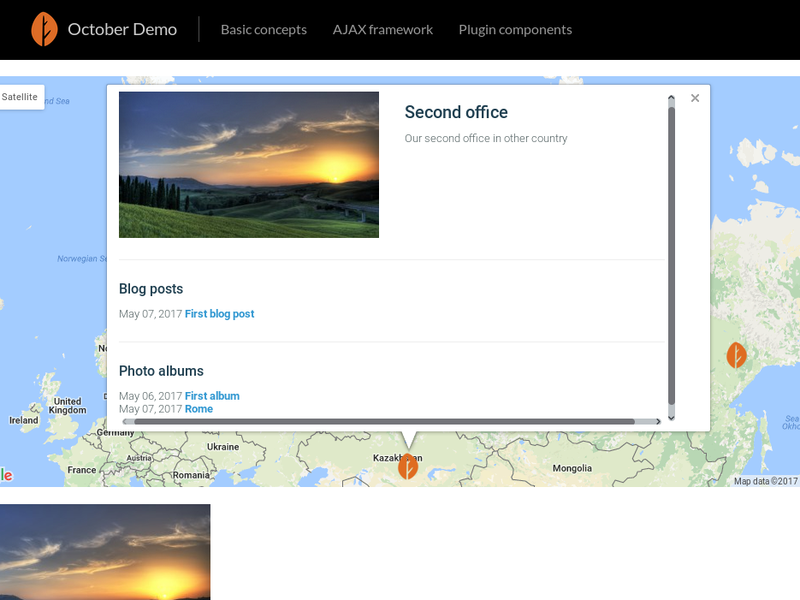 For each marker you can display a title, image thumbnail, description and links to attached blog posts and photo albums. See partials at components/markerslist/ - default.htm is for the component markup and marker.htm is markup to display each marker. Great plugin! Is there a way to implement a search function if you have alot of markers? There's no markers search functionality at the moment. I'm not sure what kind of search could be implemented. I guess it couldn't be Site Search because markers don't have page components. Some autocomplete-like filter on MarkersList component might be in order but I didn't think of it before. Maybe you could describe what kind of search you have in mind in project's github issues? I'd take a look when I got time. Great plugin!!! I think you should pinpoint that an image should be set as Icon so they can appear as markers in the front-end. Thanks for the review! Where do you mean to pinpoint it? I think it is already called "Marker icon" in component settings. Do you mean another place? Feel free to contact me on Github or here from contact form in my profile if you like.